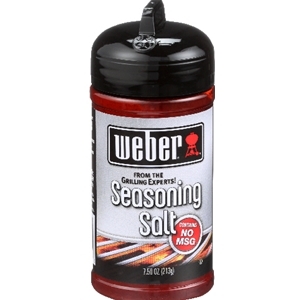 Versatile Seasoning Salt is the subtle secret to many grilling success stories. The flavorful combination of salt, sugar, onion, garlic, and spice enhances the taste of steaks, chicken, pork chops, potatoes, barbecue sauce and even popcorn. Salt, sugar, spices (including paprika and turmeric), onion, cornstarch, garlic, paprika oleresin (color), less than 2% silicon dioxide to prevent caking.